Mobility Print simplifies the printing process for students printing to Print Release Stations. It enables students to print from their personally owned devices, such as smartphones, tablets, laptops, or Chromebooks. Make sure your device is connected to the Wi-Fi Eduroam. Click on Mobility Print Setup which will navigate you to the setup instructions. 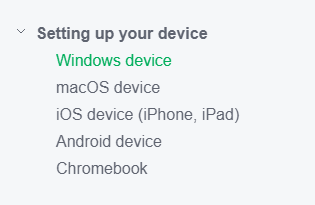 Depend on which device you are printing to, click on the link under Setting up your device and follow the instructions.